Much of our kids’ time spent playing outside is spent in the backyard. We don’t have a landscaping “budget,” so to speak. I’ve tidied up the flower beds around the deck, moved some bushes since we moved into the house, and several years back I bought some perennials (so I wouldn’t have to keep buying them year after year). So, what I am saying is, the kids don’t spend a lot of time exploring nature in its natural habitat, but neither do they get to see nature cultivated and landscaped in a way that fully expresses its potential as an art form. For the former, we head out to a state park for camping or hiking. For the latter, we turn to botanic gardens, arboretums, and designed parks (like those of the legendary Olmstead). 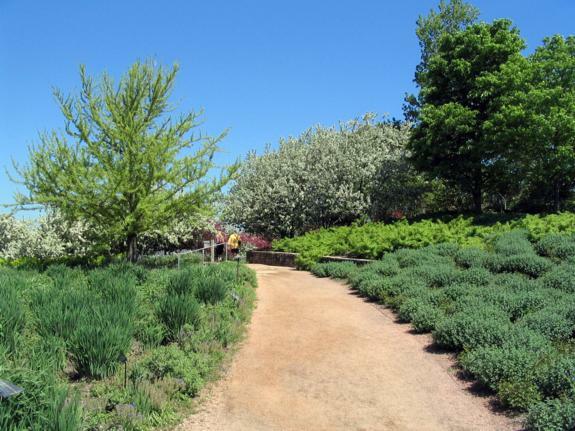 This weekend we had the opportunity to visit the Chicago Botanic Garden in Glencoe, Illinois. On a Sunday morning, to our surprise, cars were flowing into the garden like ants into an anthill. We soon saw why. The place is simply stunning, and not just for adults. We came with the expectation that there would be some selling involved. Tater, all of 19 months, is cool as a cucumber. He’s happy to look at whatever you show him. But Grace’s four-and-a-half-year-old mind wants, nay “needs,” stimulation. We often have to keep activities lively with an ongoing discussion of what she’s looking at and why it’s worth looking at. Not so much, however, at the Botanic Gardens. Our visit wasn’t terribly planned. In fact, our first thought was that this would be like an arboretum�we’d drive through then park for a bit and maybe stroll around for a half hour. Instead we found a heartier garden than we imagined. We picked up a map in the Visitor Center, saw a sign about a bonsai show, and headed in to see what we could see. 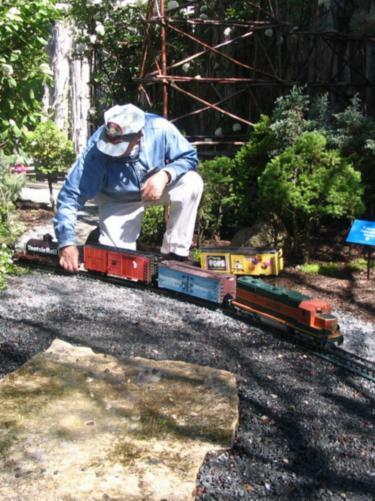 Through sheer luck we walked straight to the Model Railroad Garden. There a small admission price for this area, but the look on the kids faces as they wandered through 1,600 feet of model railroad landscape was worth it. The displays represent landmarks from across the United States, from the White House to the Corn Palace of South Dakota to Seattle’s Space Needle. Of course, Thomas and Percy and James have a corner of the garden, but much more interesting to the adults are the more than a dozen other trains. After the model railroad, we strolled over to the Regenstein Center where we wandered through the small court of bonsai trees. Grace has a thing for small trees, and this kept her attention for a little while. Then we were off for a longer walk, out over to Evening Island and its impressive Carillon, then back to find our way out to the Japanese gardens on the next island. Families were everywhere, and our kids had a lot of fun making friends. There wasn’t time for the kids to take a class or really dig into the children’s activities, and when we go again, we will bring better shoes for the kids (the flip-flops did not serve us well), perhaps a snack and some water, and we will carve out more time. You could really spend an entire day here and not regret a moment of it.